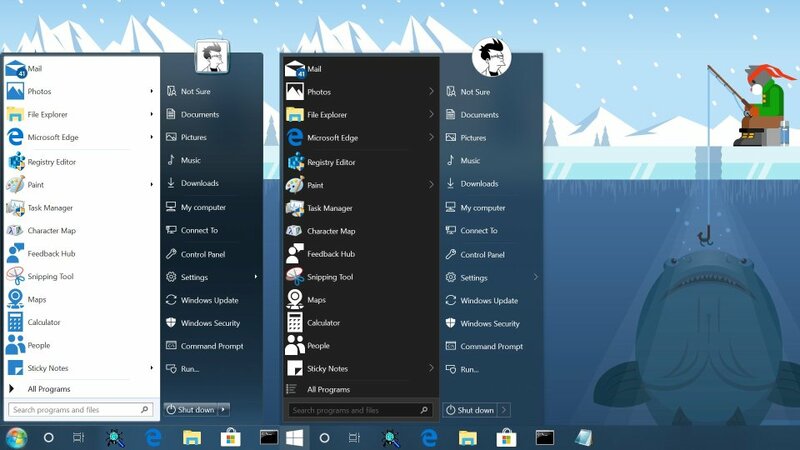 Start menu is back and it's better than ever. Get the most useful shell enhancement for Windows 10 now! StartIsBack fully integrates with Windows and provides original Windows 7 start menu and taskbar experience, enhanced with many new features as well. It looks totally awesome with new style, round user avatar and modern glyph icons. Also it opens 100% of a time and always finds what you want to find - sorry, Windows 10 gimmick! Whether you're power user or senior citizen, StartIsBack will work for you. StartIsBack is actively developed - you can get StartIsBack for Windows 8, StartIsBack+ for Windows 8.1 and StartIsBack++ for Windows 10. Each version is tailored for specific Windows version to be able to address weaknesses of each Windows release and gain strength with targeted features and clean user experience. Lifetime license - just $3.99! Works with any StartIsBack version. How do I configure Start Menu? Either right-click Start button and click "Properties" or right-click opened Start Menu itself and choose "Properties" context menu item. Can I use StartIsBack without start menu, just for skinning / jump list / awesomeness? Yes. Just pick leftmost (Windows 10) style. 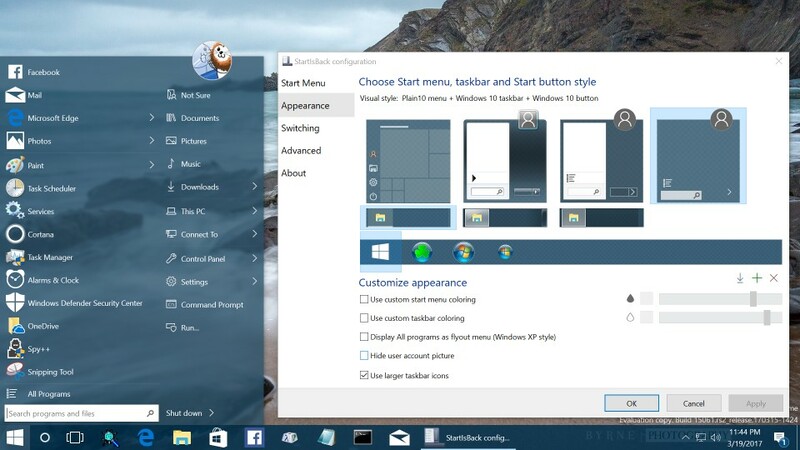 Then select taskbar and start button styles separately. Can StartIsBack break my system? No. If you experience issues with old StartIsBack on too recent Windows 10 update, just hold Escape key when logging in to disable StartIsBack. How do I uninstall StartIsBack? As expected: go to Control Panel - Programs and Features, find StartIsBack and click Uninstall. There are no limitations in trial version. After installing it runs for 30 days. If you don't activate it with license number you bought within 30 days, it will still work, but in limited mode: Start Menu will be blank and sad; every boot you'll be nagged about evaluation period over. Trial period runs for each user which have installed StartIsBack on one PC separately. What is activation and why is it needed? Activation is a process of validating your license online. It ties your computer to your license via online service. It is required in order to make sure license use is not abused. One license key allows you to activate a limited number of computers. How my computer is identified? Your computer is uniquely identified by motherboard unique number and hard disk physical serial number OS is installed to. What if I change hardware configuration of my PC or replace it? If you change both hard disk and motherboard, you will need to activate your license again as modified PC will count as new. You can activate your license on new PC after 30 days since you used license on the old PC, so you may need to wait while trial period is over. No. StartIsBack does not collect information about your PC hardware or software. It does not use Internet connection for license validation purposes except the moment you activate it. Online activation service does not collect your IP address or any other information which could identify you or your computer. Computer unique identifiers are transferred in hash form, which does not allow anyone else to view it. Note: automatic new version checking functionality requires Internet connection. How many times can I reinstall / reactivate StartIsBack? There is no limitation on how many times you can activate an installation on the same PC. No, your license will never expire and is valid for all future versions of StartIsBack. This download is intended for Windows 10 only. Check Additional downloads for archived program versions for Windows 8 and 8.1. StartIsBack is digitally signed by Stanislav Zinukhov. Do not download StartIsBack from untrusted websites. Before downloading, installing or using this program you must read Personal License Agreement and agree to be bound by it. English, Russian, Brazilian Portuguese, European Portuguese, French, Danish, Greek, Italian, Turkish, Spanish, German, Polish, Czech, Croatian, Slovak, Finnish, Korean, Dutch, Norwegian, Serbian, Slovenian, Bangla, Hungarian, Swedish, Simplified Chinese, Indonesian, Arabic, Thai, Traditional Chinese, Farsi, Ukrainian, Lithuanian, Bulgarian, Latvian, Japanese, Romanian, Hebrew. Place downloaded file into StartIsBack 'Styles' subfolder. You don't need to pay anything if you don't need this new particular functionality! NEW: Jumplists replacement! StartIsBack now provides custom taskbar jumplists which are much more reliable and responsive. StartIsBack taskbar jumplists are optional (Windows 10 v1607 or higher is required) and customizable with Windows 7/8/10 styles. Also new custom jumplist can do some mac tricks yours can't. Major version. Read what to expect! Major update. Read what it brings. First public StartIsBack for Windows 8.1 version. Read what it brings. 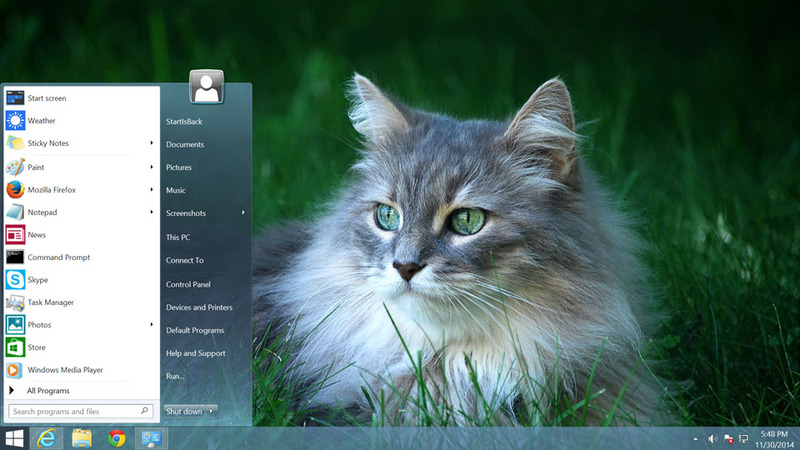 Hot: Advanced option - Show taskbar on Start screen. Very useful on tablets! You can easily buy StartIsBack license with PayPal or direct card payment (with Gumroad). All payments are processed securely. Paypal payments from China may be delayed for several days. You should receive license key to your buyer e-mail address in several minutes after payment. StartIsBack Personal License can be used only for personal purposes. You must agree to be bound by terms of license agreement. 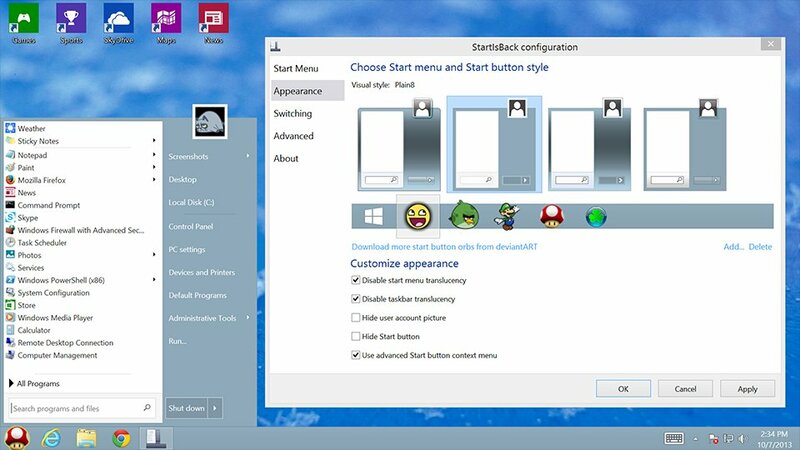 If you're a visual styles (skins) creator and intend to make visual styles for Windows 8 with Start Menu skinned, or you want to promote StartIsBack with review, you can get StartIsBack license key for free. Contact me. If you want to use StartIsBack at business environment, you should buy Business License. StartIsBack is perfectly suited for corporate use: 100% compatible with all Windows 7 start menu group policies and settings + has additional group policies which will help you restrict features as well as customize appearance. Offline license activation (Only licenses for 1000PC and up). Does Business license requires downloading special version? No. Currently, Business license key is applicable to standard StartIsBack version you download. Can I split, resell my license key? No. You can't resell, split, sublicense, lease or rent your license key. You may want to resell Personal Edition instead. How do I proceed with offline activation? You should receive license key to your Paypal buyer e-mail address in several minutes after payment. Please check your spam folder. Sorry, but there are no alternate payment methods now. If you have lost or never received your license key, use the form below.